The ‘Icon’ series from EMI invariably selects well. Transfer may vary – certainly according to one’s individual taste – but at their best, and I thought some of the recent Cortot transfers were good, they offer fine work for minimal outlay. Housed in a uniform style box, with often as not seven CDs, we have good value for money. These are of course time-sanctioned performances as well. As for the Chopin performances enshrined here collectors will have most of them in some form or other, though maybe not both sets of Lipatti's selection of Waltzes and maybe not the subfusc live Liszt Concerto or the Bartók. Otherwise we also have other expected things - the inclusion of the canonic Grieg/Schumann concerto performances, Bach, the ‘last recital’ and the Third Enescu Sonata amongst others. A few pointers may serve to guide the undecided. 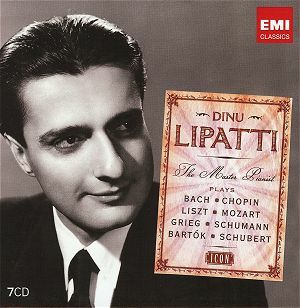 Lipatti's Chopin Op 58 Sonata is a touchstone for many people and it remains for them the greatest recording - dangerous words - that has yet been committed to disc. I couldn't possibly dissent. In its combination of poetry and constantly changing prismic colours and pedalling it is a reading of the most articulate humanity. The Nocturne in D flat minor, from a London session in 1947 made just a fortnight before the recording of the Sonata, is one of almost unparalleled beauty. Ferociously self- critical though he was one hopes that Lipatti had some measure of understanding as to the true depth of admiration in which he was held during those precious fragile years of his maturity. We also get live Zurich performances from 7 February 1950 – a bit of jangle on these compromised recordings. Lipatti chose his own running order of Waltzes. Two selections are presented here, both very well known. One is from Geneva, the other Besançon, both from 1950 and made several months apart. The Geneva performances are however much the better known and the ones that have circulated for decades on EMI. The ‘Last Recital’ performance replicates to a very large degree the running order of the Geneva selection. I'm sure one might quibble with one or two slightly over-emoted internal contrasts but such mean spirited dissention has little bearing on performances so richly characterised and buoyantly alive. These are performances of the utmost grace and beauty, recorded in the brief remission afforded him during treatment for the leukaemia that was soon to kill him. The Chopin E minor Concerto was released on Jecklin JD541-2 where it was coupled with a live broadcast performance of Bach's concerto BWV1052 with the Concertgebouw under van Beinum – which is also on this Icon set - as well as some Etudes and the D flat Nocturne Op.27 No.2. Obviously this is the real thing not the Czerny-Stefanska performance that was for so long alleged to be Lipatti. Though the sound is constricted we can hear through it to the heart of Lipatti's playing. He plays with great beauty of tone and considerable metrical daring, in the first movement especially. The cantabile of the Romanze is ravishing. This is a rare and precious survival. The Liszt with Ansermet is similarly compromised in sound quality with a lot of scratches on the acetates. Still, at certain points Lipatti seems to leap out of the aurally depleted sound-stage like a daemon. The first movement trills galvanise and the slow movement is a study in poetics. A synopsis of the other recordings shows how well attuned the Icon series is to the iconic nature of them. There are the famed Bach performances where his studio performance of the B flat Partita is fleeter and more obvious exhilarating than the ‘Last Recital’ performance. Articulation is of great clarity and depth. Nobility of voicings distinguishes so greatly the Chorale Preludes. The A minor Mozart sonata is here of course. Then, in the third disc, we have the four hand Brahms Waltzes recording with Nadia Boulanger and that superb 1943 Berne performance of his compatriot Enescu’s Sonata. The Schumann and Grieg concertos aren’t contained on the same disc, and I suppose they are necessarily here. The Lucerne/Karajan Mozart K467 concerto is here but of greater wider appeal will be those recordings that have emerged over the years, such as the Bartók, the live Chopin and the live Liszt. Sound degradation is a small price to pay for these riches. Lipatti’s Liszt is fluid and virtuosic. In the Bartók Lipatti’s contribution outmatches that of his collaborators, who sound technically hard pressed to keep up with him. The Bach concerto is especially beautifully and movingly conceived and executed. Doubtless collectors will have the majority of these performances on various labels, and will have filled in rarities such as appeared on such as Jecklin. But I commend the balance between known and rare in this extensive collection.